A special photo of the North Cape cliff a grey day in January. 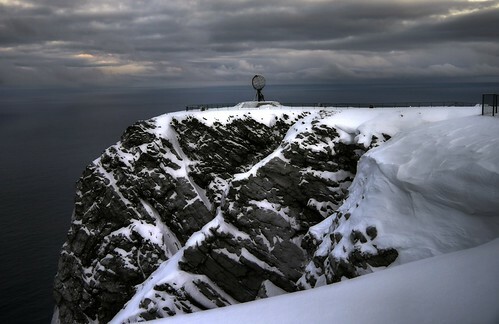 Few visitors only the North Cape globe symbol out there by the steep cliff. This may happen the few days when there is no Northbound coastal express - only a car convoy of 4 cars led by a huge snowplow to and from the main road. Going in at 11AM and out 01.45PM. Believe me - being almost alone at the most Northern point of the European mainland - is for sure a special event. Nothing else to do then than make a photo of the huge 307m high cliff covered in snow with the globe of iron at the top. The North Cape was named by the English explorer Richard Chancellor in 1553 when he rounded the cape looking for a Northeast passage to East Asia and Pacific America. After Mr. Chancellor described the cape, some famous people climbed the steep cliff from sea level. The most famous were King Oscar II of Sweden/Norway in 1873 and Thailand's King Chulalongkorn in 1907. In 1943, the Battle of North Cape was fought in the Arctic Ocean off this cape.